Broken and cracked bowling balls are the base. 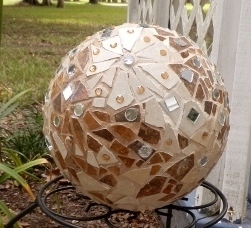 I used tile from my neighbor's floor project, glued onto the ball with Gorilla Glue (waterproof), grouted with unsanded grout, added bling with gemstones and then sealed with a waterproof sealer. It is a basic brown color but it is still pretty and has held up well in the sun and rain. I am almost done with the blue themed one.